For those who like to enjoy their deck in the evening, it is especially important to consider lighting any stairs or steps on your deck this summer. Your deck is a beautiful and functional space for enjoying your yard and entertaining throughout the summer. As you host guests at your home, it is also important to ensure that everyone is safe as they sit, stand, and walk around your deck during a party or quiet afternoon outside. Whether you’re hosting or enjoying your deck during the day or in the evening, consider these easy-to-install safety features for your deck in order to ensure that everyone can safely enjoy your outdoor space in the warmer months. For those who like to enjoy their deck in the evening, it is especially important to consider lighting any stairs or steps on your deck this summer. While it may seem like a simple addition to your space, lighting can make a significant impact on your guests’ ability to walk up and down the stairs as the sun goes down. Lighting can easily be incorporated into design especially if it is installed in your stairs or the side of your railing so that each step is well lit throughout the night. No matter who you are hosting, it is always a good idea to provide railings for balance and support as guests walk around your deck and down your stairs. This will allow people to hold on to something as they are moving to prevent them from falling as they go. Railings are also an important safety feature for older adults and children, as they protect them from dangerous falls outside. Although it may sound like a minor injury, a splinter in your foot or a foot of your guest can quickly put a damper on any party. This can also help to protect your pets from injuries as well, as a splinter in their paw could cause serious infection and pain. 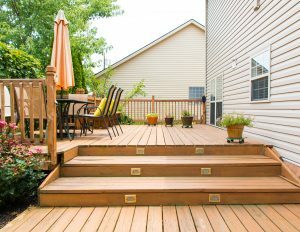 Ensure that everyone walking around your deck is well protected from any sharp objects or ends that may be sticking out of the wood. A protective seal can help to keep your deck looking great, as well as ensure that the surface of your deck is smooth and ready for entertaining throughout the summer. Ready to Enjoy Your Deck?